I'm making three olive oil cakes, recruiting my family and friends as taste testers to vote for their favorite. The winner will be made for LA Food Bank charity fundraiser Eat My Blog happening June 19th at Tender Greens in West Hollywood. Part I was the Greek - Cat Cora's version. The winner will be announced in Part III. 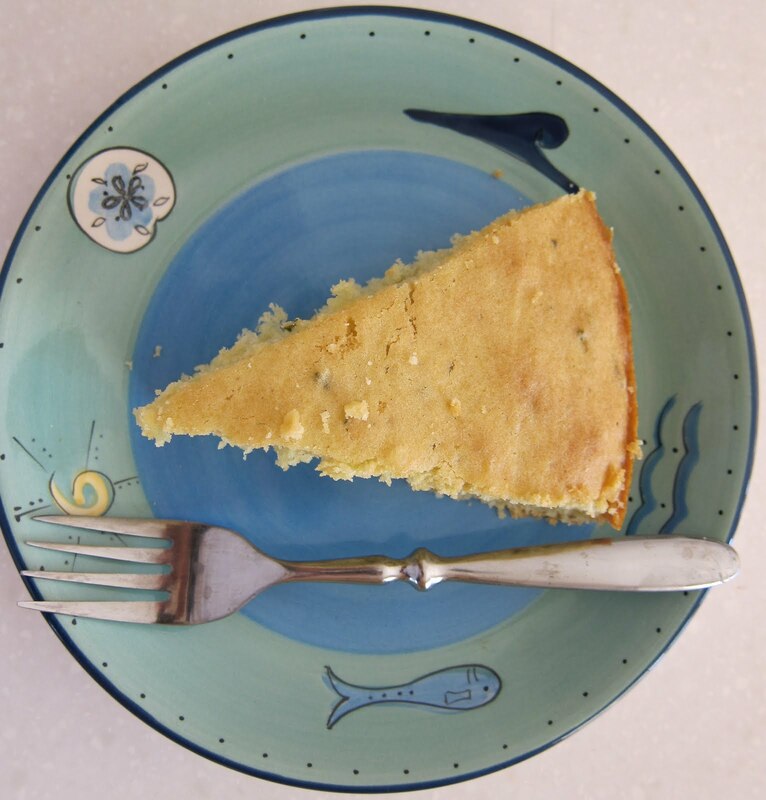 When I came across the recipe for Olive Oil and Fresh Rosemary Cake via Foodatista, I was a little skeptical. She/He hadn't updated her/his blog since 2006. Was this post one of the last doomsday hurrahs for this short lived bloggette/blogger? I dug a little deeper and found some other people using the same recipe. I love all things rosemary and Mario Batali and I love his olive oil cake at Osteria Mozza so this seemed like a no-brainer. Plus, my neighbor's rosemary bush is out of control. Plus, maybe the charity fundraiser Eat My Blog customers will like this one? So I gave it a whirl and tried this recipe out; clipping my neighbor's rosemary bush, nearly being nominated as "Neighbor of the Year" for my good deeds. I had high hopes. I followed the recipe to a T like an A++ soldier. The rosemary flavor was spot on, but I don't want to ruin the results to be posted in Part III so I will stop now and leave you with the recipe below. See? A perfectly golden crust! Preheat the oven to 325 F. Spray a 10-inch loaf pan with non-stick cooking spray and set aside. Using the whip attachment, beat the eggs in a mixer for 30 seconds. Add the sugar and continue to beat until the mixture is very foamy and pale in color. With the mixer running, slowly drizzle in the olive oil. Using a spatula, gently fold the rosemary into the batter. In a separate bowl, whisk together the flour, baking powder, and salt. With the mixer on low speed, gradually add the dry ingredients to the egg mixture. Pour the batter into the prepared pan. Bake for 45 to 50 minutes. The cake is done when it is golden brown, springs back when touched, and a skewer inserted in the center comes out clean. Allow the cake to cool briefly in the pan, then tip out onto a cake rack to continue cooling. The cake certainly looks good and I'm intrigued by the rosemary appearing in a cake. Hey, it's Mario, most of his stuff tastes fab. That cake must taste wonderful! Rosemary is a wonderful addition. Thanks for the recipe. It is so peculiar, I will try it out. Peter - Gotta love the rosemary - it's got almost a piney mastixa taste to it, maybe that's why I love it so much. Rosa - for sure, even better when it comes from the neighbor's yard! Anna, I too am intrigued by the rosemary in this! Looks great Anna! Peter - yeah, the rosemary is a great addition! I want to make cookies with it now. I literally just bought rosemary two days ago so I could make this cake. Coincidence? It was great meeting you last night and I hope this is the cake you chose for Eat My Blog...then I won't have to make it myself! Esi - Hmmm you should try making it! I thought it was a little too dry and eggy but I loved the rosemary so maybe I would add it to the winner :)) So good to meet you !! Rosemary and olive oil? Oh, swooooon! I hope this one gets the green light.